On cold winter's day I decided to do a little office cleaning. Naturalists must have a genetic affinity for Neotoma cinerea, the pack rat. Stuffed up on a dusty top shelf in the office, I found an old cracked green plastic binder with a small peeling typed-out label affixed to the top reading, "PROGRAM MATERIAL." Buried inside this treasure trove of nature center history was a neatly typed up booklet called "Nature Safari" This was my kind of booklet. It was a self-described treasure hunt and I assume it was intended for summer campers back in the late 1960s or early 1970s. Kids love these types of take home reminders of summer. This one had them locating all kinds of materials outdoors and required them to find answers such as "What color is the iris of a garter snake's eyes?" Great question! The kids had to go find a snake, catch it and look it in the eyes. This is direct experiential education. The last two pages of the booklet interested me the most. They were titled, "TREASURE HUNT FOR THE BEAUTIFUL RATTLESNAKE ORCHID"
Rattlesnake orchid? In my time at the nature center I knew of three orchids growing on the property. I have personally seen the yellow lady slipper and the rose pogonia. We've had purple fringed orchids as well, though in seven years I've never seen them bloom. I have found suspicious green orchid-like leaves in the right places so perhaps there is hope. I have never seen nor heard of rattlesnake orchids on the property. With somewhere around 600 acres of land, it shouldn't be surprising if I miss something out in the less explored areas. Fellow naturalist Paul Smithson and I read through the directions but there were problems right off the bat. "1. Proceed west along south shore of Terrapin Lake following a lightly used game trail for about 175 yards." It took a moment for the confusion to set in. Perhaps we had read it wrong. There is no southern shore of Lake Terrapin. The very first direction seemed impossible. As any good pirate knows, X may mark the spot but it would be foolish to make a treasure map too easy to solve should it fall into the wrong hands. The best way to keep the treasure hidden is not to hide the treasure but rather to hide the starting spot. There was no X telling us where to begin. We poured over the treasure hunt directions trying to decipher their meaning. We felt like members of the Goonies having discovered a treasure map in Mikey's attic. The lake does have one east-west arm that is bound on the southern side by a glacial esker. One could conceivably call the stretch of land on the south side of this arm, "the south shore of Terrapin Lake." We started to get excited. Based on how we use the area today, and a fair deal of pirate-naturalist type thinking, we agreed on the most likely location for the secret starting point. We knew where to start, would we be able to find the treasure? It was months until the snow melted and I had the time to look. On a summer day, I followed a game trail looking for the rest of the clues. I followed the lakeside trail with an eye out for glacial erratics. An erratic is a boulder brought down from the Canadian shield riding on the glaciers. Large boulders are relatively common in the woods and lakeshores. I was looking for a particular formation of boulders mentioned in the treasure hunt directions. I was pressed for time that day and I didn’t find the rocks I was looking for. Still, I knew I was close. Months later I stumbled upon an old, downed barbed wire fence that was surely the one talked about in the hunt directions. I was even closer and more of the pieces were coming together but some of the clues, such as specific trees, were no longer standing. I'm pretty sure I was close and I searched around the area but there was no sign of the rattlesnake orchids. I still hold out some hope that they are there and I missed them but I know this is probably not the case. The forest has changed in the past thirty years. The oaks are getting old and dying off while the maples are taking over. Exotic species such as buckthorn and garlic mustard are on the rise as well. We once thought earthworms were good for the forest but now we see that the introduced nightcrawlers are slowly changing the forest too. These non-native worms eat away the duff layer of decaying leaves too quickly and it is this layer where most woodland wildflowers grow. 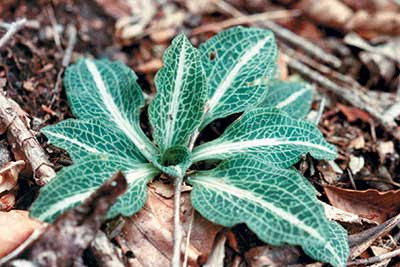 The rattlesnake orchid may simply not be able to grow in our forest anymore. For me, it remains a legend. When you go on a treasure hunt you may not always find the treasure but the effort is always a reward. I may never find them, but I'll keep looking. Sometimes you just need an excuse for a hike in the woods.